Credenzas. They're a more relaxed brain zone than desk tops. On desk tops, serious work gets accomplished - if time isn't doodled away on surfing or gaming. 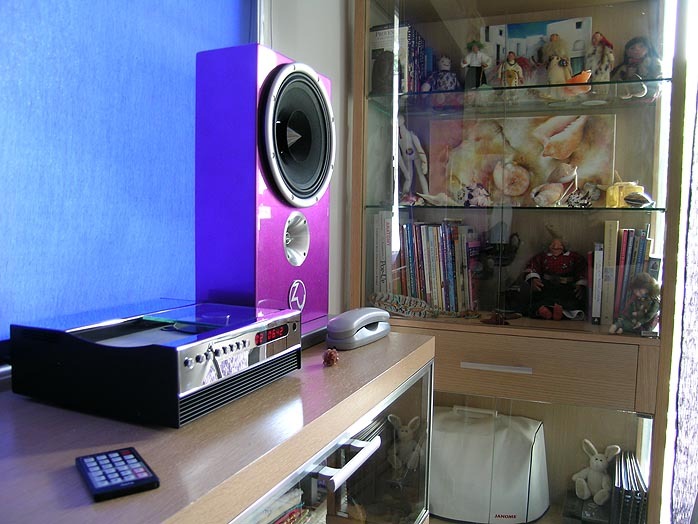 In which case, souped-up video and sound cards and a snazzy little desk top speaker system are the shizzle. In audio parlance, that's listening in the extreme nearfield. Speakers are at the very most three feet away from your bobbin' noggin. 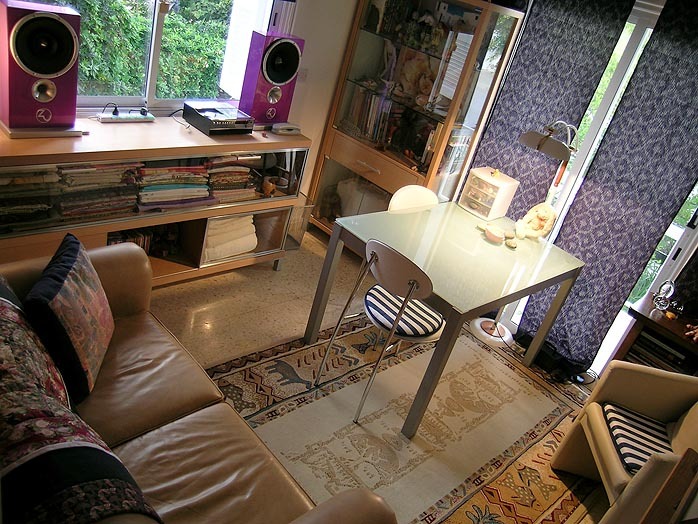 Credenzas on the other hand tend to be living space or bedroom creatures. That's where altars to stereo are at best marginally tolerated. Usually, they're outright verboten. Sound is fine though, even greatly desired. Credenzas simply don't want to see much of it. Sure, one component and a pair of fashionably attired speakers will be acceptable. But those speakers better match the decor and be demurely sized. Or else Fabio will throw a tizzy fit. Fabio is the decorator. Don't mess with Fabio. Enter the Druid Credenza. It doesn't appear to be an extreme nearfield speaker. Neither is it a bookshelf monitor. Parking it atop a stand will look a bit funky. The credenza is really where it belongs. It'll be at the right height and, because the speaker is shallow, sit close to the wall. And because the book of color options has no word limit, Fabio will call 'em just fab, baby. Truly, it's anything goes, from flats to semi-gloss to full-on automotive lacquer to multi hues to FX. If you can dream it up, Zu's custom paint boss Jason will lay it on. And does he ever - lay it on thick when it comes to multiple coats for pearlescent effects immaculately applied. The man's a genius in the paint booth. uses this cone as supplied from their OEM. Zu sprays on a solvent carrier to introduce a new binding agent. "Without this, the cone does not have the structure to support the full bandwidth due to slower internal cone velocities especially when combined with our motor. Which leads to the outline of a few other key design features of the motor. Until recently, Eminence had not been modeling -- or at least not implementing -- any devices in the motor for controlling the dynamic AC behavior of the coil and its relationship to the fixed armature, the magnet assembly. Those drivers that do employ such features as shorting rings are not found in too many of their products and none in their 10" drivers. The Zu driver does utilize diamagnetic materials in its motor to influence and shape the inductive dynamics under power, of the interaction of static field and music (AC) field of the coil. And this is not simply a simple little shorting ring. "Considerations and design features relative to frequency, the eddy currents formed (the shape of the B fields of the coil relative to frequency and wave form) are also manufactured into our driver. And these features are fully operative and designed to continue to be effective even under extreme SPL demands. Just last week we finally found the thermal and mechanical limits of our Zu260FR/G2 driver. The test found the thermal limit of our system, which reflects how accurate my AC modeling was and how solid the implementation is. It took 2000 watts RMS of metal music program with an LR 2nd order high pass set at 80Hz for 6 sustained hours!" Zu's Sean Casey clearly is into all the less visible aspects of driver design. If you manage to blow up a Zu driver, you're the kind of animal who'd scarf down a 100-oz. steak just to get it for free in the one-hour do-or-die challenge. Plus the tacky plaque on the wall. 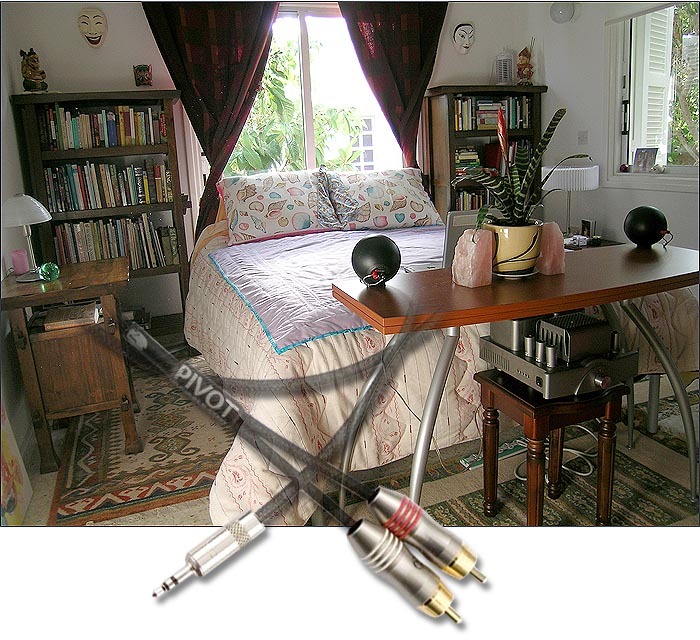 For the rest of us non volcano-jumpin', shark-diving', gator-wrestling or rave-blastin' normies, a civilized 12-ohm impedance coupled to a super friendly 97dB claimed sensitivity and monstrous power handling mean that the book on amplifier choices is wide open. From about 15 watts of tube power on up to full-blown transistor muscle is the ticket to get the most full-range performance from the Zu widebander. Staying with the credenza theme, the just-reviewed Aura Note from April Music is in fact a poster child for the minimalist living space rig - one stylish silver/black component with credit card remote, one pair of... let's see, Radical Raspberry Druid Credenzas. 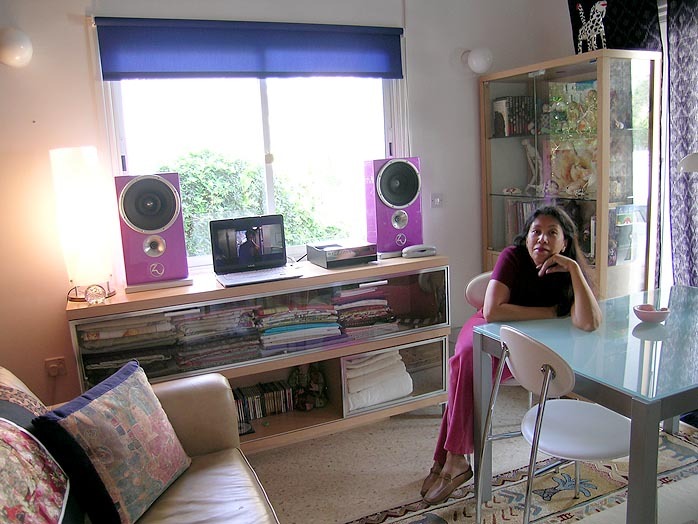 The color is because my wife, a year ago just before we left the US for Cyprus, had custom-ordered a Zu Tone in that exact hue for her new artist studio, albeit with a custom grille à la Mini Method. At the time, we had just managed to squeeze in a Zu Audio factory tour before it was sayonara USA. Then we had to get settled in a new home and country and the Tones were duly forgotten. that some credenza-inspired comments would have to be in the offing. DCs' freshly minted addition to the Zu Audio range deserves to be telegraphed to the world at large with at least a rough sketch on what to sonically expect. After all, my wife couldn't possibly be the only one to want good sound in a smart package that gets out of the way, hops on the credenza and stays put there with a minimum of component fuss. Good dog. Why am I being so laissez-faire about component fuss? Because these particular paper cone drivers -- used in somewhat different form also by WLM in Austria -- do tone with aplomb. They'll thus come alive even on cheaper, less fulsome or suave electronics. Add the highish impedance and most normal amplifiers will breathe far easier than normal. Less sweat equals more relaxed and open sound when you're an amp. Especially an affordable one. The efficiency makes for dynamic jump factor which, coupled to tone, covers the two fundamental elements for a musically compelling sound. The power handling means you can go from whisper to punk crank without prejudice. In most credenza applications, the former will of course be the far more important. It's here that low-loss conversion of very small input voltages into clearly differentiated gradations of musical expression becomes the real boon. High sensitivity and minimal network filters are important for such assignments. Things sound good at low volumes. There's no compulsion to turn it up before you can feel something. It's the Druid all over - about which we've said volumes in its earlier feature review. You'll be curious about bass extension. Despite the slide rule jockeys who routinely attack Zu for claiming the impossible (40Hz for the standard Druid's limited cubic volume and driver) those who've actually listened to a Druid invariably know better. Yes, a subwoofer would and does fill in the missing bottom octave if desired. That's why Zu makes two subs. But especially in smaller rooms, more than half the prospective Druid crowd won't bother. Junior's inbuilt wall proximity from its credenza concept plus the 'floor' loading through its open bottom with the minuscule slot created from the rubber bumpers invoke acoustic bass lift. For what, cubic volume wise, really is a very small speaker, you get a very satisfying tonal balance which plainly avoids the tinkles (when pianos sound like glassy toys). That was apparent right out of the box. For more on 'Drew' the baby Druid, I'll have to get my hands on it first. It's already disappeared into my wife's study. Her favorite piano concerto is playing in the other side of the house as I type this. For now, a few more obvious and less-so tidbits. Zu aficionados who've lusted after a Druid center or rear channel now have their poison. That's the obvious bit. What often falls under the 'ongoing research and development' bit -- in the disclaimers about how specs can change without notice -- has led Zu to a new 3-day intensive break-in routine. It's apparently something super gnarly which segued straight into Sean's first-ever blown driver. It's an accelerated, insane-impact protocol which no normal music lover or audiophile could or would ever replicate in the home. It assures that what the customer will hear pretty much out of the box once the drivers have reached room temperature is on target. Reactions won't be premature, askance and askew. Pro drivers with hard-hung suspensions are designed for the high SPLs of live concerts. They simply won't reach proper compliance with common audiophile usage. Hence Zu insures now that for the requisite duration, your new speakers have already porked out on 100-oz. steaks so you won't go evicted or deaf during the process. In fact, the low current deliveries of the affordable mid-power tube SETs and push/pulls that are very happy with these Druid loads might never properly condition the drivers no matter how long you play 'em. Call it the devil's dues for using these remarkable transducers in the first place. It's a situation the Austrians at WLM are keenly aware of as well. It goes with this beat. Incidents of shredder feedback -- where people auditioning such speakers report back highly negative -- are nearly invariably due to still raw drivers. That doesn't mean you couldn't find a speaker at the Druid Credenza's price point you prefer. The Zu sound is very specific. It's distinctly different from the mainstream. Opinions about it tend to polarize people. It simply means that once the drivers have gotten properly seasoned and are suitably powered, the resultant sound will neither lack bass nor be poor by any stretch. Different it will be, yes - but neither poor nor ordinary. Just as earlier Wilson generations especially of the Watt/Puppy divided people, the aural aesthetic of Zu still does. People who are with it, generally speaking, belong into the camp for whom heightened resolution happens only once a year - on New Year's day. Though cute and true, that's still misleading because it limits high resolving power to so-called detail. What detail? Aren't dynamics and timing very important details of music too? You see the issue. To call the Druid less resolved simply isn't accurate. It's more resolved in the time, tone and dynamic domains. These simply happen to be aspects which often aren't considered coincident with resolution. In present-day hifi lingo, resolution invariably obsesses over visual details - the satellite photo close up. How many blades of grass can you count? Zu's primary focus is squarely on resolution in the feeling dimension. Image outlines are seen, dynamics felt. Extreme image lock is visual but timing accuracy feels more live. You don't see that, you sense it. So it really depends on the focus of the listener. How does she or he approach the playback experience? If you're a predominantly visual listener, you'll be more blinded to the Druid's merits. It's as simple as that. It's at the root of why opinion remains divided. It's obvious that a 10" driver even with a whizzer, crossed to an auxiliary tweeter at 12kHz, will handle so-called detail in the upper midrange quite differently than a 4.5" mid crossed to a tweeter at 1.2kHz. It's precisely why vintage Tannoy dual-concentrics continue to enjoy legendary renown especially in Japan. Many modern Westerners meanwhile will find more than their appearance old-fashioned and antiquated. This difference in listener priorities and values sits at the core also of the Zu polarity and remains true for the baby Druid. The presentation of visual detail is mid-hall where ambiance blends with direct sounds and mellows out the bite and intense separation of the nearfield. Unlike in-walls, the Druid Credenza throws surprising depth even parked up against the wall. Due to the plinth, it'll always be out by a minimum of 18cm to the front baffle. Because the driver loading creates significant rear pressures vented through the very narrow circumferential bottom slot, you'll want a solid surface to park this Druid on. That's a given with credenzas and hutches. A thin resonant shelf which would easily support the weight should be less than ideal, however. 'Drew' is a very point-source-y speaker. That helps explain the utterly seamless sonic projection and the continuous of-a-piece staging. It's a major asset for smaller spaces where the casual credenza setup encourages listening not just in a formalized sweet spot but off-axis and close up. There's no need to sit 8' or 10' away before things cohere. Ivette's table and chair put her 6 feet away. There are no artifacts of incomplete driver integration at that distance. Here's something curious but valuable. Even more than 30 feet removed in the kitchen/living room, simply by leaving three hallway doors open, the sound remains remarkably convincing. It carries. I'm not sure why except that different speakers do this to very different degrees. Some sound very good in the room and seat for which you have aimed them but remain caged up in the room. Walk outside and the sound is instantly muffled and contained. Not here. That's a nice side effect of the friendly credenza theme. You can walk the house and be about your non-audiophile business. You'll still enjoy compelling tunes with good sound. In short, this is a music lover's speaker for people to whom audio is stuff that does its job but otherwise is out of mind and certainly nothing to obsess about. To boot, the Druid Credenza's unlimited finish options add a big artistic touch to become life-style accoutrements. That's an oft underappreciated ingredient. To enjoy music as often as possible, hifi's gotta be in the rooms we spend most our time in - the study and workshop if you work from home; the living room, den or bedroom where you retreat after a workday out in the big bad world. Speakers that fit into such spaces without getting aesthetically into Fabio's hair are the biggest challenge. All other components can be hidden behind doors. Not really speakers. Drew the baby Druid -- fully growed up to insist on being called Herr Druid Credenza, not Sir Stumpy -- is one such beast. It's fi for the people. Take my wife. She's got ears trained, subliminally now for years, from exposure to the really good stuff. In my room, I get away with relative murder. But not in the rest of the house. No sir. If you saw just how stoked she's now with her first pair of designer-approved real-performance speakers in razzy raspberry (it's not really hot pink but most certainly a girlie color). They sound every bit as good in her small studio as her hubby's boy toys in his dungeon - minus my 20Hz bass of course, my greater soundstage depth due to free air placement and that my larger space means the room begins to compress far later as you prime the pump. But who wants to listen that loud so close up anyway? If you saw her smile, you'd get the Druid Credenza without reading farther. It's got that Special Seal of Good Housekeeping Approval smack on the pointy phase-plug nose of its big happy driver. Even on lap-top flicks with black ensemble casts and their groovin', fresh hip-hop, rap and funk soundtracks, the half-size Druids have enough bass balls -- with room lift I estimate an F3 of around 55Hz -- to telegraph the get-down party mood and put the moves on your pelvis. They don't go lo-lo but are the antithesis of thin because as low as they do go, they do so with weight and fullness. That Itzhak Perlman comes across similarly convincing is testament to the fact that when harmonically developed tone, good microdynamics and superior time domain behavior join up, you can play anything. It's when you add one of those ringy laser tweeters and lean plasticky mids that software selectivity becomes more and more vital. Then half the fun stuff in your CD library turns useless. Again, people fi. It's what the Druid Credenza is on about to deliver handsomely. It zuits. The full-size Druid hasn't been in residence for too long to be certain. On an educated guess based on memory, the stumpy Druid seems just a bit more diffuse in the upper bass/lower mids while simultaneously more open on top. The latter could be pure psychoacoustics. Less bass makes the same treble seem more. Or the crossover values on the 1st-order tweeter hi-pass might have gotten slightly massaged. The former means it doesn't slam as hard as the tall boy. In either case, personal ownership of first their Druid Mk.IV, then the Definition Mk.1.5, presently the Definition Pro -- with extensive accompanying reviews -- has unintentionally turned me into a quasi Zu spokesman. That's all I'll say on the DC subject then. Let some other guys chime in with their blow-by-blow accounts to spread it around. I'll close with the obvious. Contented is the audiophile with the happy wife. PS: On the subject of 'life-style' audio -- real people fi as I think of it as long as performance is assured, both tags that fit the Druid Credenza -- consider the above micro rig. An Onix/Melody SP3 tucked outa sight feeds a pair of Gallo A'Diva Tis. The source is the same laptop my wife works on during the day and, via its USB connection, uses in her office as DVD source. Spin a video, plug a Zu Audio Pivot (RCA to mini plug iPod cable) into the Sony Vaio's headphone jack since the valve integrated here lacks a USB port. Presto, night-time movie watching at the foot of the bed, with absolutely minimum impact on decor or livability. That's the real deal. It's why this whole 'review' has remained deliberately lite and conversational. It's not about audiophile agonizing. It's about living the dream of being surrounded by music anytime the mood strikes. It's about getting audio out of your hair, mind and sight to where it doesn't take over the house. To where it serves the inhabitants without ego or self importance. From hifi to high five. That's something you can actually live with; want to live with. It's exactly why the Druid Credenza is cool. As a smaller Druid, it goes new places; loses some bass but not too much; gains some apparent sparkle on the top; but otherwise paints with the same brush of course. Based on the lot we've previously penned on the Druid Mk.IV -- with two writers owning them at the time and weighing in -- this might be welcome news not just to our household. If so, what's your favorite color?